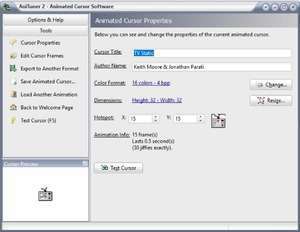 AniTuner is a utility which allows for the creation, editing and conversion of Windows animated cursor files (ANI) with much ease. This program also includes several new, improved animated icons which serve as a replacement of Windows' standard cursors which to many, are quite boring. With AniTuner, you can create animated cursors from animated GIF files or even AVI movie files. You can use it to import images from a variety of different image formats, too. For security reasons, you should also check out the AniTuner download at LO4D.com which includes virus and malware tests. Additional screenshots of this application download may be available, too. AniTuner download been highly rated by our users.